Offices in need of a heavy-duty multifunction device may opt for the Kyocera TASKalfa 7550ci colour multifunctional system. This robust MFP can print, scan, copy and fax. It has quick performance and delivers high-quality coloured and black and white output. The Kyocera TASKalfa 7550ci colour multifunctional for A3 formats offers expandable functions and has good print and copy features. It comes with built-in Ethernet for easy networking and has advanced colour technology. Print resolution can go as high as 9,600 x 600 dpi. The TASKalfa 7550ci colour laser printer is quite pricey. This large model comes with a flatbed scanner and an automatic document feeder. It also has an operation panel that features a colour touchscreen display. 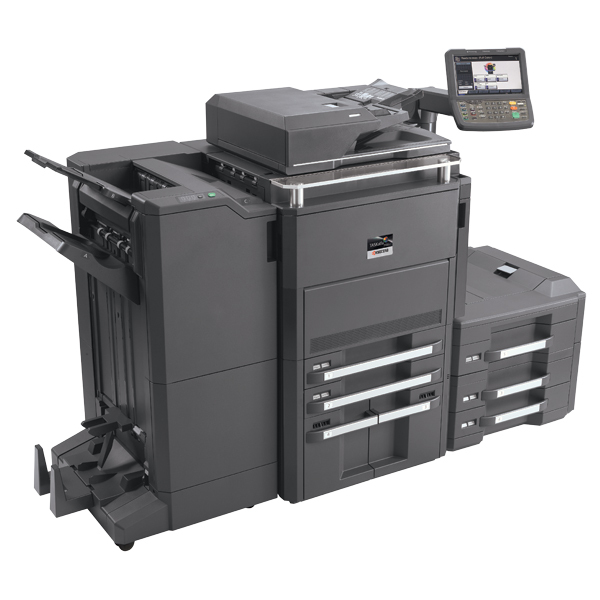 The Kyocera TASKalfa 7550ci MFP has a print speed of 70 ppm for coloured and 75 ppm for black and white, both on A4 media. The TASKalfa 7550ci colour multifunction copier can handle more than 7,500 sheets at a time and comes with a duplexing unit for double-sided printing. Users will have no trouble operating the Kyocera TASKalfa 7550ci colour MFP as it has a handy operation panel. They can also easily share the Kyocera 7550ci multifunction printer, thanks to the built-in Ethernet. This reliable model is very quick and offers excellent output. Optional finishers are offered and the TASKalfa 7550ci workgroup colour printer has expandable fax functions plus long-life components. Original Kyocera 7550ci toners are very productive and can be bought more affordably in a multi-buy pack which contains four separate black, cyan, magenta and yellow TK-875 toners. Expect this large and powerful multifunction printer to cost a bundle. The TASKalfa 7550ci A3 colour printer could be accessed by more users if it had Wi-Fi.